Passwords, the bane of many retro gamers. After a long week of writing things down at school the last thing you wanted was having to write down something from a video game you just rented or bought. No, video games were suppose to be a refreshing exit to your week and made looking forward to the next week a little more sweet. Before the luxury of memory cards or even battery backups, many gamers had to sit next to a pad of paper with their choice of pen or pencil to write down codes to log their hours of hard work. But to some writing down passwords seemed more like the modern day achievement, rather than a common nuisance. 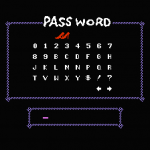 Passwords were, for many great retro games, the only way to ensure your hard work was there the next time you fired up the game, but many retro gamers quickly learned that passwords simply weren’t going to work. 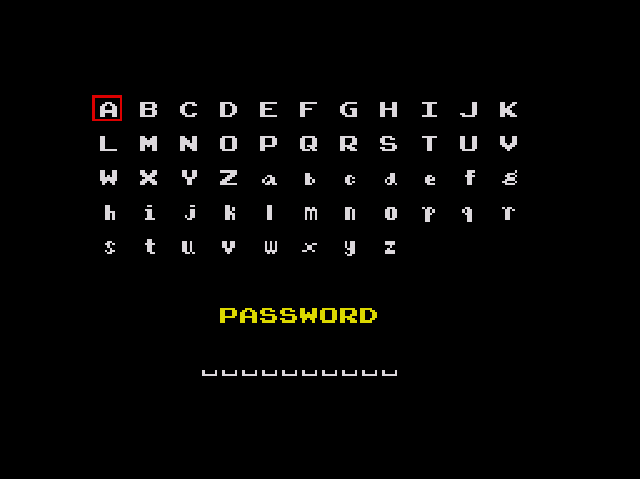 Passwords were comprised of a given combination of letters, numbers or even symbols given to the player after what in many other games would be the game over screen. Many game developers just tossed out a grid of all 26 letters in the alphabet, sometimes in lower case and capitals, alone side numbers; sometimes things got rather confusing. Lower case Q’s could have been confused for P’s or G’s, Zeros looked like a capital O, and more often than not gamers simply had to start the game all over! 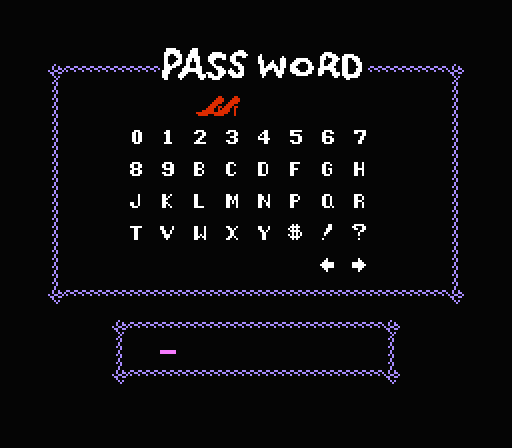 One good thing about passwords was that they were exclusive to the programming within the game, so you didn’t have to worry about renting the exact same cartridge twice to enjoy a correctly transcribed password. But still many retro gamers will have as many fond memories of mistaken passwords as they will of actually enjoying the games they were trying to write down the password for. Even after battery backup was commonplace, the 16-bit era still rolled out games requiring passwords. For the most part though, the 16-bit era learned from the guinea pig that was the 8-bit era. Passwords were much shorter and less confusing, for the most part, to write down, making games that required passwords more enjoyable to play. Today I keep a notepad on my laptop containing the passwords for games, and no I don’t mean through emulation, simply because notepad’s font is light years ahead of my own handwriting. I also take the time to scrutinize each line of the password to make sure I have it written down correctly. Sure I could easily go online and seek out a password pertaining to my current status on some retro games, but it isn’t my hard work, now is it? One particular game sticks out from my childhood that frustrated me to no end with it’s completely, and utterly, useless and pointless password system, River City Ransom. 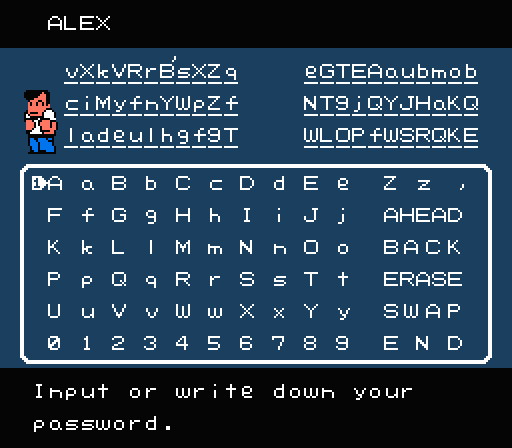 River City Ransom is without question an NES classic, but that password system left a lot, and I mean heaps, to be desired. 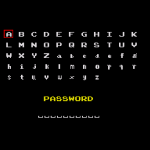 Partly because the password system required you to start a new game, press start and then select the password option; but most because River City Ransom required a whopping 66 characters per password! Passwords could be fun also, sometimes you could mash in a nonsensical combination and have the game start up with things you didn’t earn yourself, other times the password wasn’t acceptable or it just started fresh anyway. 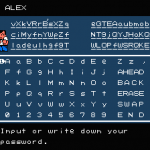 Many retro gamers would give passwords to their friends to show off their progress, or to help them out a little. I’ve found many slips of paper covered in passwords within retro game cases, or even hand written inside the manual. Today they are but a distant memory, but many retro gamers still retain the memories of frustration when a good password went bad. Love them or hate them, passwords were a part of retro gaming culture. I liken the retro gaming password to ancient Egyptian hieroglyphics, something to be remembered so we aren’t doomed to repeat our past.